If you have some sales under your belt, go to this link to install the Selling Manager tool on your my eBay page. On the Selling Manager information page, click the Subscribe Now button. After eBay confirms your login information, the system will begin populating your Selling Manager with your information from the my eBay Selling area. And the Selling link on the side navigation area changes to Selling Manager. You can click the Selling Manager link to view a summary of your sales activities. (The Selling Manager and Selling Manager Pro pages look very much the same.) This becomes especially helpful when your eBay sales start kicking into high gear. Managing multiple sales suddenly becomes easier with Selling Manager. 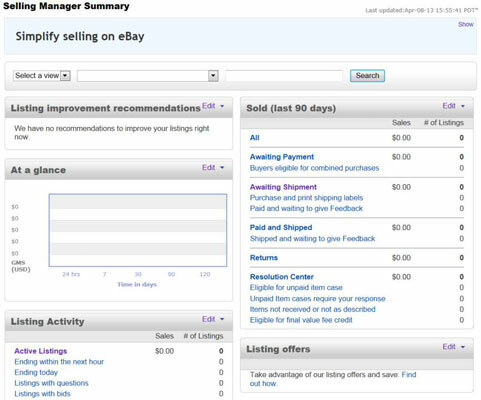 If you plan to expand you eBay business, you might consider investing in eBay’s Selling Manager Pro. It offers some extended tools to make managing high sales volume easier on the seller. And, you’ll need it! The Summary page lists at-a-glance statistics so you can see what’s going on with your sales quickly, at any time. Links to other pages are included at the bottom of the Selling Manager Summary page.